The North Carolina Society of New York is the oldest surviving state society in New York City. The society was founded in 1898 by five New York residents who were North Carolina natives and who were prominent in the business and professional community of New York in their day: George Gordon Battle, a well-known attorney and founding partner in the firm of Battle and Marshall (later Battle Fowler); George Garland Allen, then an employee of the American Tobacco Company and later chairman of the board of the Duke Endowment; James Buchanan Duke, founder of the American Tobacco Company; Judge Amasa Junius Parker, a New York State Court judge who received the Democratic nomination for governor of New York in 1856 and 1859; and William Whitehead Fuller, who served as general counsel of the American Tobacco Company. Augustus Van Wyck, a justice of the Supreme Court of New York, who ran as the Democratic candidate for governor of New York against Theodore Roosevelt in 1898, was named the society's first president. The constitution of the society, drawn by its founding members, stated that the society was established "to cultivate social interest among its members, to promote their common interests and to contribute to the welfare of the State of North Carolina." A requirement for membership was that the applicant be a native of North Carolina, although the husbands of North Carolina-born women were also eligible for membership. Membership in the society was originally restricted to men, but it was later extended to include women and graduates of North Carolina universities and colleges. The society's principal organizer and promoter during the period of the 1950s through the mid-1990s was J. Sadler Hayes, a prominent New York insurance executive who was described by the Raleigh News and Observer at the time of his death in 1997 as "Mr. North Carolina of New York." The North Carolina Society of New York in the early 2000s had approximately 500 active members. 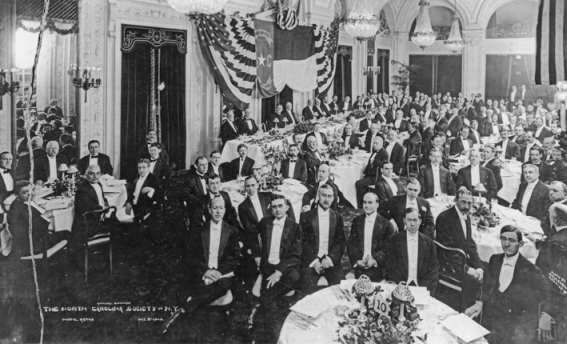 In addition to informal gatherings throughout the year, the society hosts a formal annual dinner dance in New York City to honor distinguished North Carolinians. By tradition, the annual dinner dance is scheduled for the first Friday in December and in recent years has been held at the Union League Club on Park Avenue and 37th Street. Honorees have included such distinguished North Carolinians as William Friday, former president of the University of North Carolina system; Bob Timberlake, a well-known North Carolina artist; Richard Jenrette, a prominent investor and insurance executive in New York; and Charles Kuralt and Tom Wicker, national journalists.